Feel the wind in your hair as you cruise down one of two mountain coasters in Branson – The Runaway Branson Mountain Coaster and The Branson Coaster. These alternatives to thrilling roller coasters use gravity for momentum and put you in control of the speed. Branson has its fair share of thrilling rollercoasters but folks visiting Branson are enjoying a new kind of thrill – mountain coasters. Tracks are built on the side of a mountain so that gravity pulls the rider down and around corners. Riders sit in bobsled-like cars and, unlike traditional roller coasters, control their own speed. 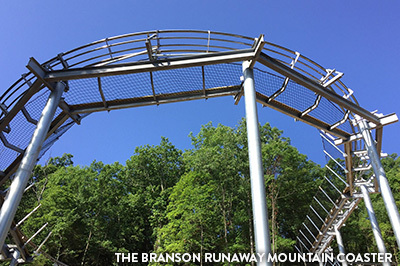 Thrilling guests with its amazing ride, the Runaway – the chief attraction at Branson Mountain Adventure Park – features nearly a mile of track and allows riders to reach speeds of up to 30 mph. If that’s too fast for you, fret not. You’re in control of the ride and each cart comes with a braking system for you to use. As you glide down the tracks, the beauty of the Ozark Mountains – whose rugged terrain offers ideal conditions for these types of rides – may rush by in a blur, but it’s an outdoor experience you won’t forget. Tight corners and two, 360-degree horizontal loops guarantee a great ride on this new-to-Branson attraction, which is what will be first of many thrilling rides at Branson Mountain Adventure Park. Oh, and if you vacation days are too packed you can ride at night, under the lights; check their website for details. 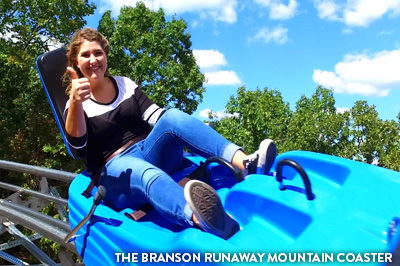 Like the Runaway, The Branson Coaster uses the region’s topography to maximum advantage. Riders on The Branson Coaster experience a 1,000-foot elevation change early in the ride and then maneuver through a series of twists and turns as they make their way toward the finish line. But that’s just the beginning. A mechanical system moves your cart into the second phase of the ride, which includes a free-fall-like feeling you won’t forget. Stay up to date with The Branson Coaster’s progress on its Facebook page and/or website. Add these mountain coasters to your list of Branson attractions to check out during your visit!